At first glance, Douris in northern Lebanon's Bekaa Valley is a seemingly normal rural village. Poultry farms and cowsheds dot the landscape. But hidden from obvious view is a growing problem — Syrian refugees who have fewer and fewer safe places to live. A look inside the poultry farms and the barns reveals a sad truth — refugee families are now living where chickens and cows lived just a year ago. In many cases, they are paying over $100 per month just to have a leaking roof over their heads and cow manure under their feet. Wikipedia. Syrian refugees in Lebanon living in cramped quarters (6 August 2012). The Al Azab family is just one of thousands of Syrian refugee families who have resorted to living in unusual accommodations. Past several rows of former chicken coops (now inhabited by other refugees), the Al Azab family has turned a cowshed into their temporary home. He and his wife and eight children share a single room that is about 10 feet by 12 feet in size. In the corner you can still see the trough where the cows used to feed — a stark reminder of their situation. Currently, Lebanon has the highest proportion of refugees of any country in the world — over one million in a country of just five million. That means that one in five people in Lebanon is a Syrian refugee, and the strain on the small country has become overwhelming. The influx of new people has caused prices to skyrocket and increased competition for jobs as refugees try to find work. All of these factors contribute to tensions between refugees and their host communities. And because there are no official refugee camps in Lebanon, Syrian families must find places to shelter on their own — places of last resort that others would never consider calling home. They end up in these barely habitable structures partly because they can’t afford to pay rent for proper living accommodations, and partly to avoid triggering negative reactions from local communities, which are severely strained by the refugee crisis. 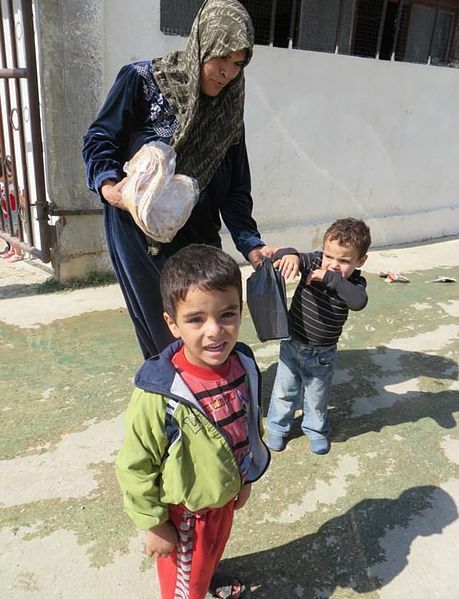 Dealing with difficult living conditions is just the beginning of the challenges that refugee families face in Lebanon. Over half of the refugees from Syria are children. Most have witnessed horrific violence and many have seen their homes destroyed by bombs or have lost family members. They arrive as refugees in a foreign country and typically do not have access to educational opportunities or even the chance to play or make friends. Currently, 68 percent of Syrian refugee children and adolescents are out of school, and many have not seen the inside of a classroom in more than three years. The Al-Azab children have not been able to attend school since arriving in Lebanon over a year ago. Before they fled Syria, violence forced them to move several times, and they missed an additional year and a half of school. For many refugee children, the pressure to generate income (for boys) or help with home chores (for girls) prevents them from pursuing their education goals. Girls, kept home by their families for safety reasons, have reported frightening levels of physical and social isolation. With the winter descending, the harsh realities of refugee life are becoming even more urgent. For many Syrians, this will be their fourth cold season living far from home and with few basic necessities to stay warm. Mercy Mission spearheaded by Sr. Mary de Lourdes (Union GB) is providing vouchers to families to buy warm blankets and clothing. Mercy Mission also distributes kits to newly-arrived refugees including mattresses, blankets, kitchen sets and hygiene supplies to help them set up their new life. The sad reality of the continued conflict in Syria means that refugees face the harrowing prospect of years of displacement. Meeting their immediate needs is crucial, but we must also help them deal with longer-term challenges like finding stable work, getting their children back in school and making meaningful ties with their new communities.